K. Giriprakash's book, titled The Vijay Mallya Story is an intriguing story of the life of Vijay Mallya, an Indian industrialist with a history of ground-breaking success. He was given numerous titles, like the King of Good Times, The Liquor King of India, King of Good Thrones, and many more. The making of this industrial tycoon, his success story, the story of his decline with the downfall of Kingfisher, and a lot of important events from his life are presented in the book. Vijay Mallya is a name that has been heard with relation to a lot of important and prime events, be it through his presence in Indian parliament, being an owner of IPL team Royal Challengers, Bangalore, or being an industrialist. Giriprakash has included lesser-known facts and stories from the professional events of Mallya's life in this book. Mallya had three decades of success with numerous businesses. 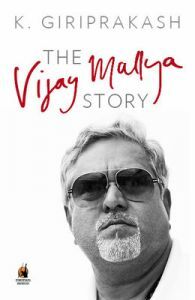 The book not merely includes the professional life of Mallya, but also of his childhood events, the business acumen he was born with, and how he shared his relationship with his father. The book explains how his skills and the business-dealing abilities got him a long period of unmatched success, while the fall of Kingfisher has been a break in his reign. The author has done in-depth research on Mallya's life, and the major and minor events of his business life with some interesting details of his young days are all included in a compact and captivating manner in this book. Penguin Books Limited published this book in 2014 in paperback. K. Giriprakash, currently works as the Chief of Bureau at The Hindu Business Line. Before this, he worked as Chief of Bureau at Business Standard. He has been tracking the details of Kingfisher for the last fifteen years, and these details have been compiled to make his book The Vijay Mallya Story.